One of the aspects that worried me about finishing the Boeing F4B-2 was how I was going to reproduce the corrugations on the tail surfaces and ailerons. At one point I was considering gluing thread to the surface, but decided this would be heavy, very boring to do, and could come out looking hairy. Home-made corrugated paper was another possibility, but this would have been difficult to produce, and heavy again. Eventually I decided to have a go at spraying them on. Taking the tail components, as an example, these were first airbrushed with a light coat of matt white enamel, thinned with cellulose thinners. 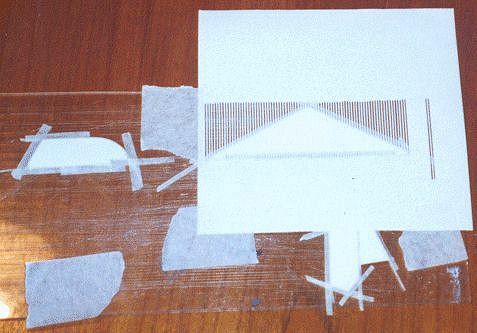 When dry, the outlines (which are free of corrugations) were masked with thin strips of paper masking tape. The parts were taped down to a board around the edges, so the paint could only reach the centre areas of the tail units. 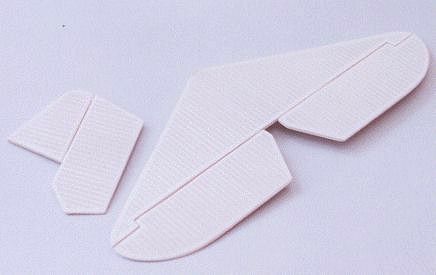 A mask was cut from a piece of thin card, consisting of lots of thin slits, 1 mm wide, spaced 1 mm apart. (I doubt very much whether this is scale corrugation spacing, but seemed to create the right effect!) You will need a sharp knife and a steel rule for this. The slits should be long enough to cover the largest part you want to paint. There is no point in making the slits too long, as they become more prone to waviness the longer they are. The mask was positioned over the part to be sprayed using a piece of tape along one edge only. This allows you to lift it up during spraying to see how things are looking. If a bit more contrast is needed, drop the mask back down, and spray a bit more. With the white base colour, I found you needed only a very light shade of grey to get a nice effect. The card mask does not have to fit tightly down on the surface - a bit of overspray actually makes it look better. Also, mist the paint on really gently, and build up gradually until you are happy with the contrast. Each component was painted in turn, allowed to dry, then turned over on the board, and the reverse side sprayed the same way. The full effect is only obvious once the masking around the outline of the parts is removed - the contrast between the smooth and "corrugated" sections was most pleasing. The photo below is a bit washed out - the stripes are rather more obvious on the real parts. Afterwards, the same mask was used for the ailerons (using dark yellow) , then put away in a safe place for possible future use.